Alfred Tennyson is considered the voice of the Victorians. His poetry was published throughout most of the 19th century and achieved an unparalleled readership. 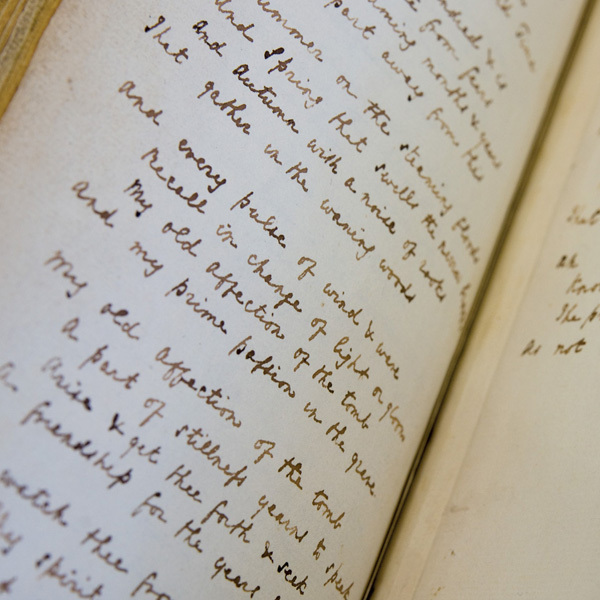 The manuscript of this poem had been on display in Lincoln Central Library as part of a deposit of Tennyson family material made in the early 1960s. It was put up for sale in 1980 along with other choice items from the Tennyson archive, including the manuscripts of Tennyson’s play ‘The Cup’ and his poem, ‘Merlin and the Gleam’. The work is located in the Tennyson Research Centre, Lincoln Central Library, in the ‘butcher’s book’ which is considered of great importance to the cultural history of the country. In Memoriam has been described as the characteristic poem of the Victorian age. Published in 1850, it was inspired by Tennyson’s intense grief at the death of his beloved friend, Arthur Hallam, in 1833. In over one hundred lyrics, he voiced the concerns and anxieties of the whole generation: love, longing, grief, death, doubt, redemption. Purchased by the Heslam Trust (1980) as part of the acquisition of Tennyson material by Lincolnshire County Council in 1980. Tennyson was born in Somersby, Lincolnshire and was educated at Louth Grammar School. He fi rst began writing poetry at the age of eight and was encouraged to continue by his family. In 1828 Alfred entered Trinity College, Cambridge where he won awards for his poetry and met Arthur Hallam who became a great friend. In 1850 Tennyson became Poet Laureate, on the death of William Wordsworth and was offered peerage by Queen Victoria in 1871, and became the first Lord Tennyson. He died in 1892 and is buried in Westminster Abbey.